Ollie Harbin, at 87 years old, was experiencing severe pain down her right leg for nearly two years. 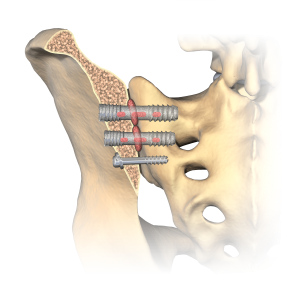 She had conservative treatment which consisted of physical therapy and steroid injections, however, her pain continued to intensify. Mrs. Harbin became dependent on a walker and cane which made it very difficult to continue doing what she loved to do – bowl! 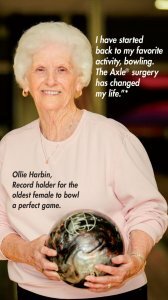 Ollie is an avid bowler and holds the record for the oldest female to bowl a perfect 300 game. She knew she had to find another solution if she wanted to get back to her passion. XTANT Medical proudly sponsored the Donate Life Float, themed “Teammates in Life”, in the 2017 Tournament of Roses. Our sponsorship provides an opportunity to give back to our donor families, to support and give thanks to our recovery partners and Donate Life America, and is part of a national effort to share the life-giving message that organ, eye, and tissue donation saves and heals lives. The 2017 Pasadena Tournament of Roses theme, “Echoes of Success”, highlights the story of how our charter has developed through the selfless contributions of others and celebrates their inspirational gifts. 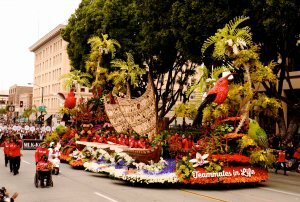 The Donate Life Float, “Teammates in Life,” featured 96 honorees on a spectacular Polynesian catamaran. The catamaran was propelled by a team of 24 organ, eye, and tissue transplant recipients rowing in unison with strength gained from their donors. The sails of the vessel were adorned with 60 floral portraits of deceased donors, promoting the empowerment of their gifts in the lives of others. Twelve living donors and recipients, including a “kidney chain” of three living donors and their three recipients, walked alongside the float carrying flowers in celebration of the life they have given to others and the quality of life they continue to enjoy themselves.